well, my tank of $10/gallon 100 octane was running low, and i thought i’d blend in some 91 octane to keep her going down the road. i picked cinda’s favorite gas station on alton just east of university because it created a fun albiet brief freeway rout to get to it. “thanks, man!” i said back as he proceeded to an open gas pump on the far side of the station. This entry was posted in 240Z on February 18, 2018 by kyle webb. about the history of the Z car. this is one of the best, most accurate, and complete histories i have ever heard. enjoy. This entry was posted in 240Z, 280Z, 280ZX, 300ZX - Z31, 300ZX - Z32, 350Z, 370Z on September 1, 2017 by kyle webb. the worst, and by worst i mean most dangerous intersection and stretch of road in all of irvine worst–michelson between culver and butler. the worst. like someone’s-always-about-to-do-something-stupid worst. i can’t believe they just did a u-turn-in-front-of-oncoming-traffic-and-almost-hit-a-pedestrian worst. so i don’t really care as much if i get hit in the volvo, whatever. but i do care about being hit in the Z. so on my way back from my parent’s house (see this post) i turned on sandburg to go around the worst. as Z fate would have it, i saw a garage sale sign on bayberry, the honey-and-bee guy bayberry, and figured i might as well stop in. it was getting late, so i didn’t expect to find anything actually. i was wrong. as i pulled into a parking spot near the piles of stuff in this house’s driveway, a women “of a certain age” literarily came running up to the car exclaiming “i love your car! i used to have one!” she was quite taken with the Z. she wanted to know everything about it. so i parked and got out and immediately pointed to my license plate ZSTORYZ and told her that she’s proof of my premise that everyone has a Z story. she had seen my Z around the neighborhood. as it turns out, she had had a 1978 280Z and loved it. she shared stories about buying it, and her relatively short time with the car. it clearly had made quite an impression on her based on her animated and exuberent descriptions of her time with the car. “go get nick!” she shouted as if i was going to make a hasty retreat. who’s nick i wondered. it’s ok, i thought, i can wait. turns out it was her son. she wanted him to see a Z in person. he was a young guy, high school or early college, with some cool round blue mirrored glasses and longer hair. he was genuinely interested and we quickly got into a discussion of classic japanese cars, in particularly, the 240Zs, and 510s. he asked me if i liked toyotas. supars, i said. he was interested in the older corolas and in particular, the AE86…but not drifting. gotta love a good 80’s wedge no mater who makes it. he was a car-guy i could tell. the conversation wandered around cars, both mom and son, Z stories hence and now. she even recalled a mechanic she used to use in costa mesa named nick. NCK! i said, he’s the last one to have worked on this Z. he’s back in business i told her and she seemed so glad. she was interested in which car shows showed my car in. i mentioned the motorsport show and the father’s day show at our church. which church she asked. mariners church just up the street. during our conversation, a couple stopped to buy some things at her garage sale and she made it clear to her friend now manning the sale that she was involved with a much more important conversation than the $2 shirt they wanted to buy. and we went back to discussions of Z history and the stories of life and family that intertwined therein. when i pulled out the original window sticker, she grabbed it and yelled, “WAIT LET ME GUESS”. she wanted to guess the price, and overshot by just a bit. she guessed $6,000. it was heartwarming to be having a conversation with a random woman and her son about a car made some 44 years ago. the memories that a 240Z sparks in other people bring me such joy. people love to talk about their Z’s. 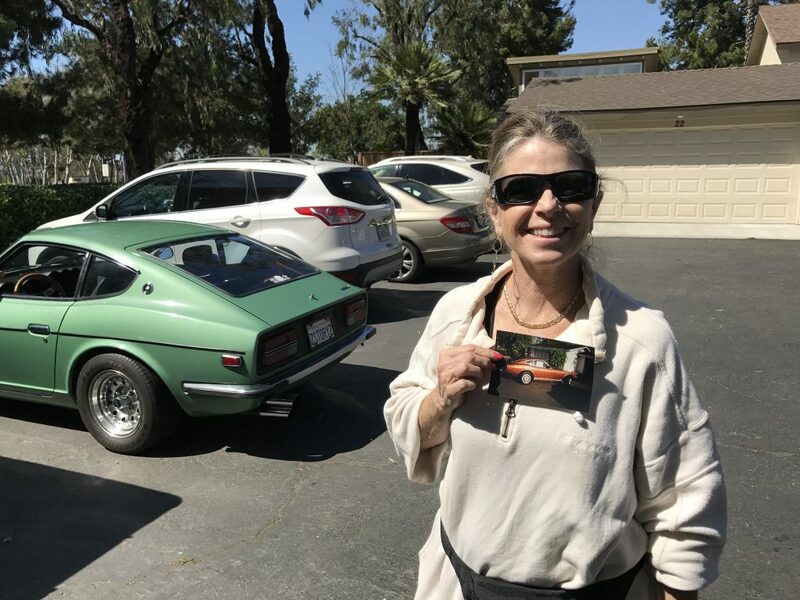 she even ran back into her house at one point and brought out a photo of her rootbeer brown 280Z. it had some amazing 80s pin-striping, and a rear window louver that had been painted brown to match the body. on the back, she had written info relevant to selling the car. “just” 98,000, original, and asking $2,500. she got the asking price, but now she sure wished she could have reversed that decision. she brought her husband over and introduced me to him as well. in the course of our conversation i had learned that he was a sea king too! (CdM HS) but was in the class of much-earlier-than-i. previous in our conversation i had welcomed her to get in and sit down. she had brushed it off, almost embarrassed. but after our brief time together, and having seen her son get in and sit in it, she went over and got in. she was home. she could not believe how quickly it came back to her. the dash, everything. even the smells. even the little wire that connects the car to the hatch so the window defroster can have power, she remembered. she was back in her Z. i had to take her photo. in the course of our conversation, i asked her son nick if he was a car guy, and he said of course yes. as stories meandered around cars and Zs, i also mentioned that i was into SAABs. affirmingly he acknowledged he also really liked SAABs. in fact, he was particularly interested in the 9-3 viggen. good taste. and he knew SAABs enough to know that that is one of THE SAABs that will be collectable some day. i mentioned that i was next to one of the only 23 remaining yellow viggens just last night. i got an email address so i could send them more Z info. and i felt it only fitting to offer to let nick take it for a spin. i know it sounds crazy, but how better to create more Z stories than to let a young enthusiast drive or ride in one for the first time. turns out that earlier in the conversation we had a fun banter about the experiential necessity for a car to have a stick shift. he said he could drive a stick. he mentioned the inability to be distracted by your phone–i mentioned parents being distracted by their babies. generational differences. he quickly admitted his skills with a manual transmission may be a little rusty. so i suggested i could drive if he wanted to go around the block. mom thought this a grand idea, and i could tell she much prefer i drive. so we got in and i fired it up. we’re just going around the block and will be right back. they could probably hear us the entire trip, especially when i was able to open it up a little out on university. he liked the sound. a lot. he seemed to “enjoy the ride”. and i felt like i’d been part of creating an experience wherein a mother and a son can now share at a new level part of their shared history. you see, she did happen to mention that he was the reason she had to sell her Z. no room for the baby seat in the back. 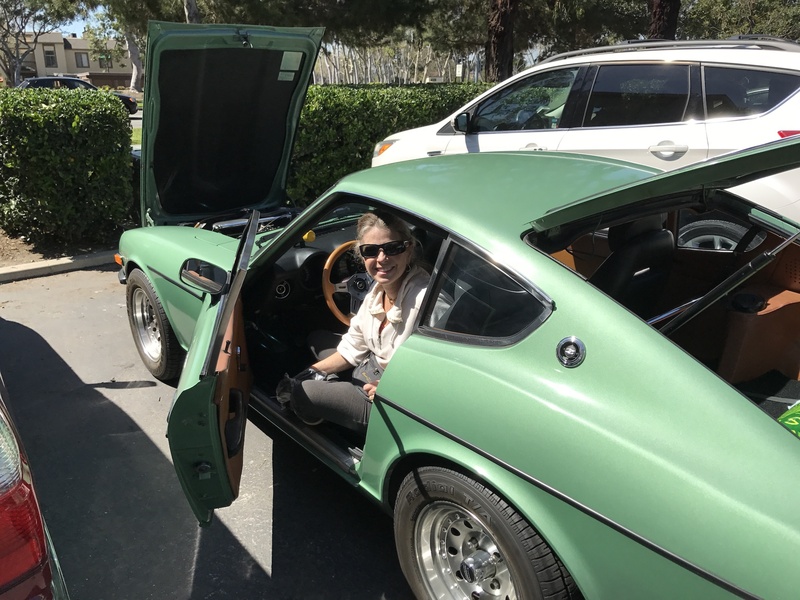 she was apologetic to him, it was an awkward banter, but a chance for her to affirm her love for him was more valuable than a Z…even a super clean 1978 280Z. relationship-building via a Z story. my work here is done. and my new Z-friend said i had made her day. it made mine too. it’s days like this that make me think that there really is no value you can put on a car that can bridge generations and evoke such memories in perfect strangers. i think i’ll keep it around for a little longer. This entry was posted in 240Z on April 1, 2017 by kyle webb. not only has the california drought basically come to an end, but my Z has finally made it out of the garage! i didn’t realize how much less (fewer?) i drive it when there’s the threat of rain. and today was a day of Z stories that it reminded me of one of the reasons this car is a keeper. i got my mom and dad a video doorbell for my mom’s birthday, and figured i’d get the Z out for the quick trip to their house to in stall it. started right up after at least a couple of weeks in hibernation. i forget how fun it is. even for short trips. [sidebar – couldn’t take the 9000 because of a seatbelt issue… that’s a SAAB story for another time!] we got the doorbell in stalled, mom had a hair appointment and dad and i were hungry for lunch so i asked dad if he wanted to go get a sandwich. as we approached the Z now parked in on the street in front of their house, a man waked by with two golden retriever puppies. yes, of course my dad insisted on petting them, and the gentleman owner, “Vladamere,” asked about my 240Z, guessing the year and ultimately striking up a conversation that lead to him asking if i might be interested in selling it. he said his son was interested in older cars “with no electronics.” i told him i wasn’t really planning on selling it, but who knows. after a bit more conversation, he asked if i would stop by and show it to his son on our way out. he lived right around the corner. i quickly agreed. his address was 512. i remembered that by association with the ferrari 512BB. dad and i got in and drove to met vladamere at the house around the corner. his son was just leaving in his new mercedes SUV…he was going to urban garage to do some work on his custom guitar or his “fastback” mustang, i wasn’t sure. his dad kinda insisted that he get out of the merc and come look at the Z. he wanted him to see a good clean example of a 240Z. that felt good. the kid had long hair, and seemed to be pleasantly impressed but was in a bit of a hurry. i acknowledged his urgency and encouraged him to move along. as he drove away, i reminded his dad i know where he lives, and he knows where my dad lives and if i get the hankering to sell it, i’ll for sure let him know.